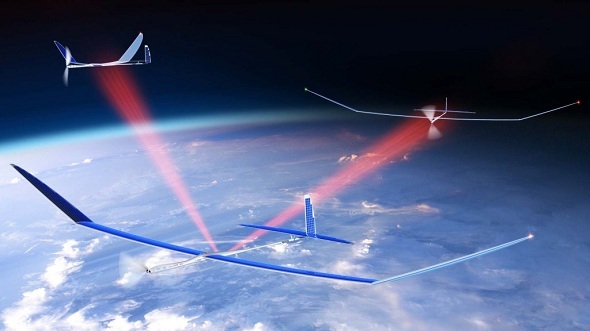 Google Inc., has acquired solar-orbital drone marker Titan Aerospace, the one Facebook had been eyeing for months to compliment Project Loon which aims on delivering wireless internet to remote parts of the world. Facebook on the contrary settled for a 20$ million deal to purchase a U.K-based marker of solar-powered unmanned aerial vehicles company named Ascenta. Moriarty, New-Mexico based 20 people startup; Titan Aerospace will be joining Google; however monetary terms of the deal haven’t surfaced yet. Several hints that the company will be working with Makani, which is again an early stage project aims to build airborne turbines in order to generate energy have been going on. Titan Aerospace builds cheaper and adaptable drones ‘Solara aircraft’ which are atmospheric satellites carrying operations of an orbital satellite. What is peculiar is that these drones are solar-powered and can charge themselves up during day time in order to function at night. Titan Aerospace are capable of staying at an altitude of 20Km above sea level, without the need to re-land for five years. On the other hand, the current Google Project Loons balloons are capable of staying in the air for no more than 15 days. The drones can also be used for weather monitoring, disaster recovery as well as earth imaging and communications which can be an added advantage for Google businesses such as Google Maps, as well as other data services. Titan drones are capable of delivering internet speeds of up to 1 gigabit per second and are expected to make its first commercial operations debut in 2015. The deal is expected to help Google deliver faster and wireless Internet in remote regions of the world, such as the southern hemisphere where Project Loon – a small network of balloons designed with the same aim had been tested several times. Investing in drones isn’t new for industry giants. Last year in December, Amazon.com Inc. collaborated with Octocopters to deliver goods within a 10-mile radius from its warehouse, with the aim of using them in commercial operations in next four to five years.